By Amanda. These last couple of weeks have been hella crazy weather here in the sunshine state. I don't think we've ever experienced this much rain in a very long time. We get our occasional afternoon storms during the summer that last all of 15 minutes and then disappear, but it's been a consistent down pour and we just aren't built for that kind of rain. We've had a bunch of flooding here in the Tampa Bay area, and my poor in-laws neighborhood is about 3 ft underwater right now. Luckily, we are on high ground so we didn't experience too much flooding but it was still a very dreary and wet weekend. With the weather being as brutal as it has been, I decided to scan Pinterest and look up some easy DIY's to keep us preoccupied. I recently cleaned out my purse and found an abundance of freebie restaurant crayons so I decided, why not re-purpose these? I bought some silicon molds awhile ago, so when I came across this pin on Pinterest, I thought: "yep, I'm going to make those." Pardon the awful lighting as this was the best I could get under the doom and gloom that was going on outside. First, peel all of the wrappers from each crayon. It helps to take a knife and slit the wrapper so you can easily peel. Next, separate your crayons into whichever color category you are feeling. I went with warm colors vs. cool colors. Start chopping! *Disclosure: We cannot stress enough to be super careful chopping up crayons. 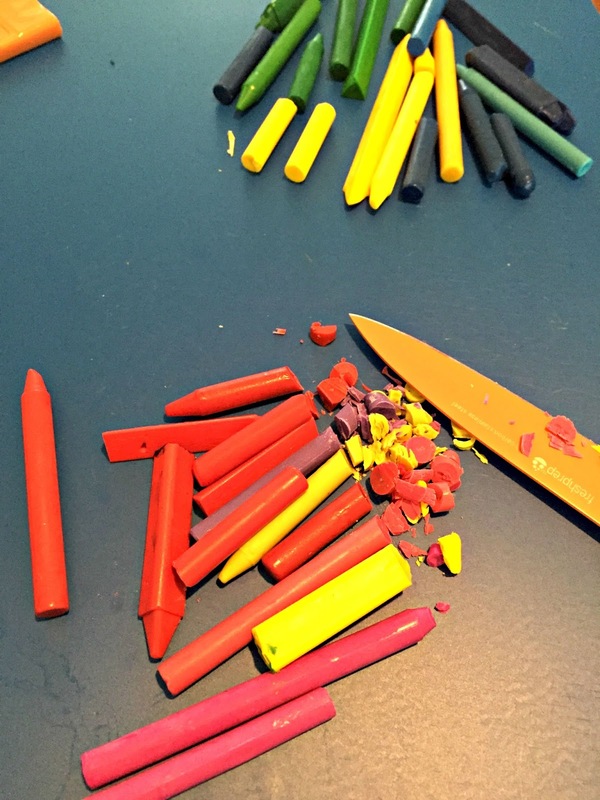 Taking your knife to rolling crayons can be dangerous and messy. * We'd like for you to keep all your fingers. I suggest using a utility knife or a knife that you don't generally use for cooking, unless the crayons stain your favorite kitchen knife, or worse, you don't mind that your chopped food ends up tasting like crayons even after a good knife washing! Haha! Once all the crayons are chopped, fill your silicon molds with the pieces all the way to the top. 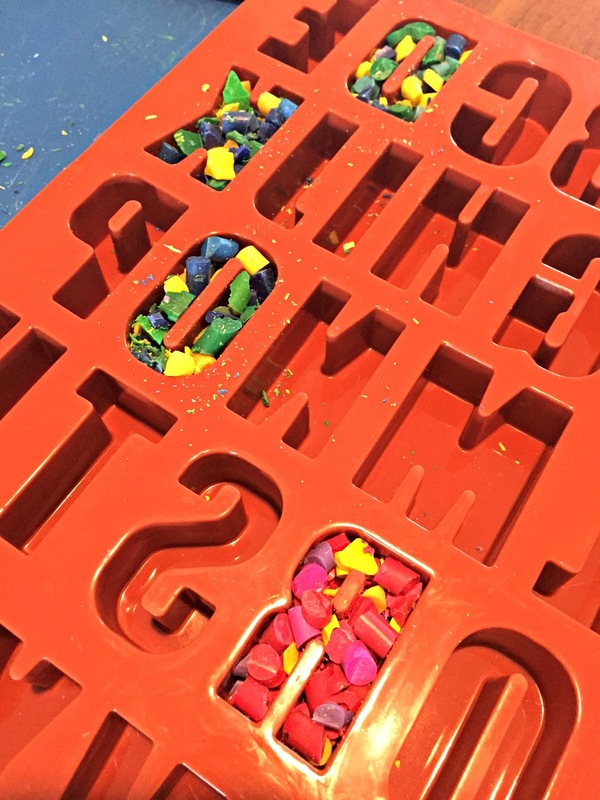 You'll also want to place your silicon mold on a baking sheet or pan lined with aluminum foil or parchment paper before placing it in the oven, in case any crayon wax melts and drips. Place in the oven and bake at 230 degrees for 15-20 minutes. You'll notice that as they've melted, the crayon wax is very runny, so be careful removing it from the oven. You thought your kid coloring on your walls with crayons are bad? 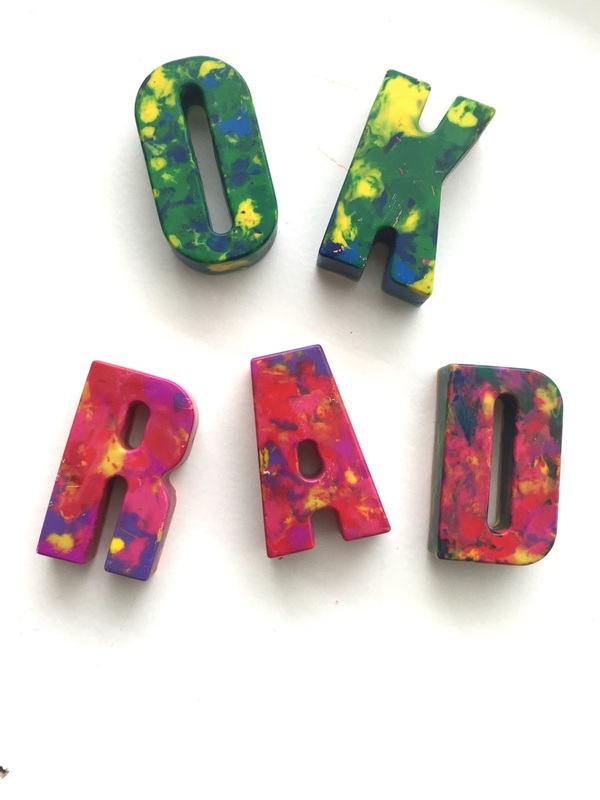 Melted crayon wax is a whole other beast. Be sure to let them cool down and harden up before popping them out of the molds. How fun are these colors and the letters?!? Verdict: Super cool craft to pass the time, and re-purpose all of those half broken, weird crayons laying in the bottom of your bag. Plus, they're a hit with little hands to color with new shapes and learn their alphabet, and the color combos make for awesome coloring!